1. We created X3watch because accountability is a good thing. The word is often hijacked and turned into a bad thing, but we believe accountability is good. I wrote a book about this very topic. It’s called Open, and you can download the first chapter – “Accountability Is Good” – for free here. 2. I worked personally on every version of X3watch from 2003 with Chris on a Windows PC up until 2013. Ryan took over as CEO of X3watch in 2013 with the goal of re-launching the core technologies and moving everything from scattered developers to one team, which means the product now works across all systems with one account. Since Ryan has taken this over, he has built an entire team that handles the whole software experience and taken this to a whole new level. 3. I believe X3watch is the single best tool/resource we offer here at XXXchurch.com. It has by far had the most impact, and everywhere I go to speak, someone tells me a story of how X3watch changed their life. Let me explain: X3watch (the software) doesn’t change anyone’s life, but X3watch enables you to have open and honest conversations with others, and in turn that changes your life. X3watch helps you tell a better story. 4. X3watch was free and still is free. Yes, we have a premium product, but we also have a free product that works on across four different platforms. No one else offers this and no one else you buy software from is a non-profit 501(c)3; they are a for-profit business that are interested in the Inc. 500 company list and turning a profit. 5. 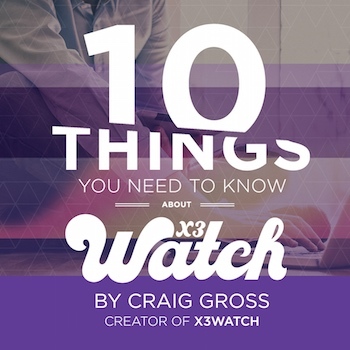 Over 1 million people have downloaded X3watch since 2004. If you are still on the original software on your Gateway Computer, you should check the site for the latest downloads as we have made some updates over the years. 6. In 2013, a group of 15 people, including my wife and myself gave a total of $360k to rebuild the software from the ground up. This group of people believes that accountability is a good thing like I said in #1, and also saw this opportunity as a huge win for our ministry, since monies from the premium version go directly back into funding ministry projects. 7. I drive everyone crazy on the X3watch team. I am on the road, I get your emails, I see what you say on social media, I want to do everything you are asking… and do it today. But the reality is: developing a product across 4 different platforms is tough and takes time. We do things more efficiently than most companies I know, but my goal is to make the best accountability software, and I can assure you we have a team in place to do this – we just can’t do it all today. It is a process and takes some time and a lot of money. 8. We listen to you and need your help. The first Mac version of X3watch was built by a young kid named Russ who was a XXXchurch fan in high school. The first version of X3watch for PC was developed by Chris, a student in my friend’s youth group. We now have a team of people across the world working on this product, but we listen to you and could use your help. When you see problems with X3watch or areas where we can improve, we want to hear about it! And if you want to join our beta team of testers, we welcome and encourage that. 9. Be proud of X3watch. Nothing bothers me more than seeing people be embarrassed about using X3watch. Hold your head up high and be proud that you want to tell a better story. Remember a good story requires more than one character (Tweet This! ), and X3watch helps you in that. 10. A lot happened in 2014. You can find out all about our very busy 2014 in this short recap. More to come from the rest of the team! Life is better when you live it open. Start your new story today. For more information on X3watch, the only FREE accountability software out there, check out X3watch.com today. The post 10 Things You Need To Know About X3watch (Part 1) appeared first on XXXchurch.com.